Mitch McConnell of Kentucky has said a thing or two about the Asia-Pacific. Kentucky is blessed (or cursed) with a very interesting pair of Senators. Rand Paul, with his outspoken foreign policy views and willingness to filibuster, grabs many of the headlines. His senior colleague, however, has much more influence over the course of U.S. foreign policy. Mitch McConnell has served as Kentucky’s Senator since 1985. He has acted as the Senate Majority Leader since January, moving up from the Minority Leader position in the wake of the GOP’s victories in the 2014 midterms. No one has ever accused Mitch McConnell of having “flash,” but he’s widely regarded as one of the most powerful men in Washington. McConnell’s foreign policy views are generally regarded as conventional, and he has rarely made foreign affairs a central aspect of his campaign. It would be hard to characterize McConnell as an “offshore balancer,” a term that fits more easily on his junior colleague, Rand Paul. At the same time, McConnell seems to lack much enthusiasm for neoconservative hawkishness, even as he holds the line on many issues that the neocons care about. Like most Republican senators, McConnell signed Tom Cotton’s letter warning the government of Iran against committing to a nuclear deal, and McConnell never emerged as a public critic of the Bush administration’s handling of Iraq. However, he did reportedly warned the Bush administration in 2006 that if it did not develop a plan to get out of Iraq, the GOP would suffer a devastating midterm defeat. At the same time, McConnell was publicly castigating Democrats for advocating a withdrawal plan. 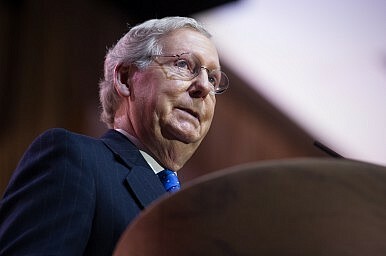 This accords with the general impression of McConnell as a pragmatic, effective politician without particularly strong views on foreign policy. McConnell has undoubtedly pushed hard on the Trans-Pacific Partnership, husbanding together a bipartisan coalition in the Senate that has so far eluded McConnell’s counterpart in the House of Representatives. This position accords generally with business interests in the Commonwealth of Kentucky, who have longstanding relationships with East Asia (including horses, bourbon, and cars). Perhaps the least well-known aspect of McConnell’s foreign policy agenda is his relationship with the Burmese opposition. McConnell co-sponsored the bill sanctioning the ruling Burmese junta in 2007, and has since led Senate criticism of the Burmese government. In 2012 McConnell met then-opposition leader Aung San Suu Kyi in a trip to Burma. Since 2006, several thousand Burmese refugees have resettled in the Louisville area. McConnell was just re-elected to his sixth term in the Senate, and will remain Majority Leader for as long as the GOP remains in the majority. The Republicans face a tough field in 2016, but there’s still a good chance that they’ll keep control of the Senate. At 73, McConnell is only the fifteenth oldest US senator, and might well consider running again in 2020. It’s likely, therefore, that Mitch McConnell will continue to have a strong influence on US policy towards East Asia into the next decade. This article is part of a series, written by Kentucky-based Robert Farley, on the links between the U.S. state of Kentucky and the Asia-Pacific. See his previous posts on Kentucky’s horse, bourbon, and car links with the region.